Manly Gift Baskets For Every Special Man In Your Life. Unique gift baskets for him and gift basket ideas for guys. Birthday Gift Baskets For Him - Find birthday surprise gift baskets and birthday gifts to please every terrific man in your life. Send gift baskets and presents to surprise him on his birthday. You'll find unique birthday gifts for men including gift baskets with cookies, fruit, gourmet food, meat and cheese, balloons, sports themed gifts and unique birthday gift ideas for every man. Yes, even Over The Hill birthday gift baskets and gift ideas too! Adorable Gift Baskets also offers a variety of baskets for men that are perfect for male employees or co-workers, holiday gifts for family and friends, sympathy gifts, and more. You'll find hundreds of occasions to have gift baskets designed for him delivered to all the great fellows in your life! 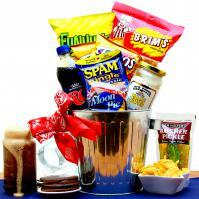 Every man loves to receive a birthday gift basket delivered to his home or office. 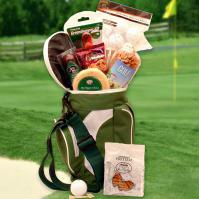 You can send a sports theme gift basket such as fishing, golfing and the like. Or send the special man in your life a delicious meat and cheese baskets or a basket of gourmet food filled with tasty snacks that are sure to will melt his heart every time. Our gift baskets for him are ideal for the man who has everything. They are designed to appeal to gentlemen of all ages, and basket gifts make smart gift ideas for a husband, father, brother, uncle, or friend. 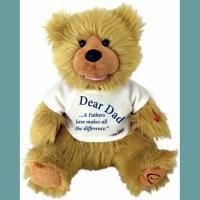 Want to surprise your dad on Father's Day with a special gift? 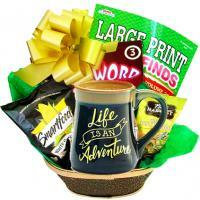 Men's gift basket from Adorable Gift Baskets will brighten his day. Choose from our value-packed golf baskets, baseball cookie gift baskets, game time care packages, fishing gift baskets, or other unique manly gift basket arrangements. Looking for a gift for a man who's not into sports? Send him one of our gourmet snack or chocolate-filled baskets. These gift baskets come with goodies that every man craves. If he favors Italian foods, Adorable Gift Baskets provides creative Italian baskets sure to satisfy his taste buds. 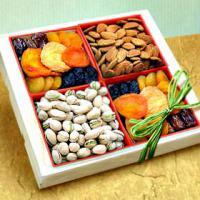 Want to send an appealing gift to your boyfriend or husband on your anniversary? Have one of our gift baskets for him delivered to his place of work as a special surprise. Send it along with an invitation to a romantic dinner or with tickets to his favorite sports team game. For the guy who loves motorcycles, try our motorcycle gift packed in an ice chest with a motorcyclist theme photo frame, a cute motorcycle teddy bear, brownies, party snack mix, crackers, and sausage.